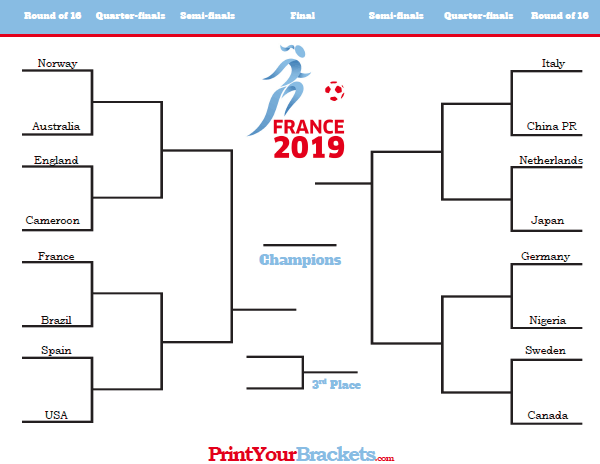 Click Here for the 2019 World Cup Group Schedule! The first stage being the group stage or the qualifying stage. The teams are broken up into 6 groups/pools lettered A through F, with each one of the groups having 4 teams. Each group will play a Round Robin Tournament, which simply means each team in a group will play the other 3 teams in that group 1 time. Here is the 2019Women's World Cup Group Stage Schedule. The second stage is the knockout tournament also known as a single elimination tournament. Only 16 teams advance to the knockout tournament. Similar to a March Madness Bracket, if you win, you advance, if you lose you are eliminated.